Kelsay Farms is a 6th generation family dairy farm in central Indiana. 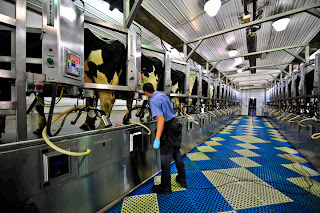 We milk around 500 head of Holstein cows 3 times a day. We farm around 2200 acres of corn, soybeans and hay. You can learn more about the history of our farm in our Real Farmwives of America post. This time of year is very busy for us because like you have read in Heather’s Farmer Friday posts we are in the midst of fall harvest. 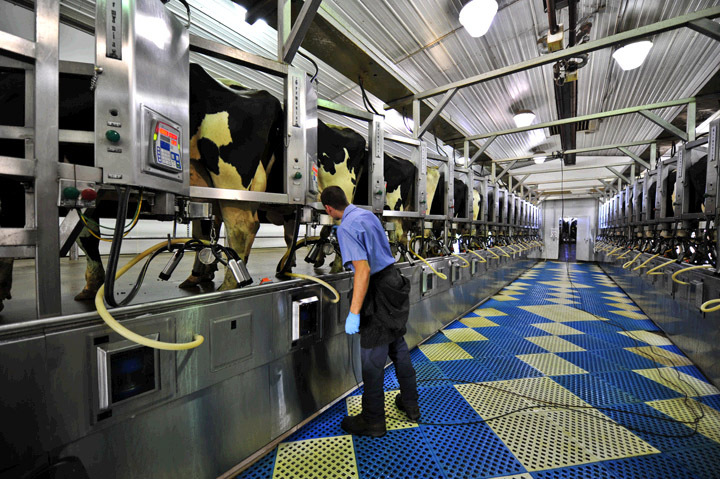 This seasonal work comes on top of what we have to do to make sure all the cows are taken care of. Our cows are our number one priority. They are like family to us and we don’t sit down for dinner until they have all been fed. The “close up” pen or maternity pen is my favorite barn on the farm. I have always loved watching cows give birth and helping the babies get a strong start in life. In fact when I was young and on my uncles dairy farm I talked one of my cousins in to going and finding ___ (can’t remember her name, you will see why in a second) she was the cow that was supposed to have her baby next. We climbed over a gate and before we knew it I was stung by over 15 different yellow jackets… not cool! Well she didn’t end up having the calf while we were there and it was a big bummer! Anyway we move cows that are about 2 weeks from having their calf to a special barn so we can watch them more closely. Most cows have their calves on their own without any problems but every now and then we have to help. Because there is a chance we make sure that someone checks that barn every 2 hours. The 2 month or so before she has her calf she is in a “dry” period or is taking a “vacation” from milking. We do this so all the feed she eats goes to growing her calf. A cow must have a calf in order to produce milk. A cow has her first calf once they are fully grown at about 2 years of age. The other reason it is busy around the farm this time of year is because Amy has developed an agri-tourism business. Every October she has a corn maze, hay rides, a cow train, pumpkins and lots of other fun fall activities. The farm is open to the public on the weekends and during the week there are scheduled school and group tours. You can find out more at, http://www.kelsayfarms.com/. Also, be sure to watch out for a FAQ post focusing on the most asked questions during the fall tours! Thanks Liz! Last weekend my family and I had the pleasure of visiting Kelsay Farms thanks to free tickets from Amy and Liz and we had a blast. 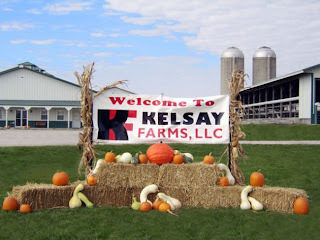 I hope if you are in the Indy you can find time to visit Kelsay Farms this fall as it is a lot of fun! Great post Liz ... love that you referred to the dry period as a "vacation" from milking. Hoping to make it out to the Kelsay ranch tomorrow! Thanks for the opportunity to guest post!! YEAH TEAM! We should get a mascot and pick some colors! Awesome blog and share ladies! Wish we were closer Amy and Liz so we could visit! Have a great weekend everyone! We're going to try to visit the farm this weekend, too. Excellent post. My sis and I are bringing 3 of the 4 nephews out to Kelsays tomorrow too. Hopefully we'll all catch up. Thanks for hosting Heather!